FOUNDED Sign - - date plaque. Personalized with the year you specify. Made in USA. 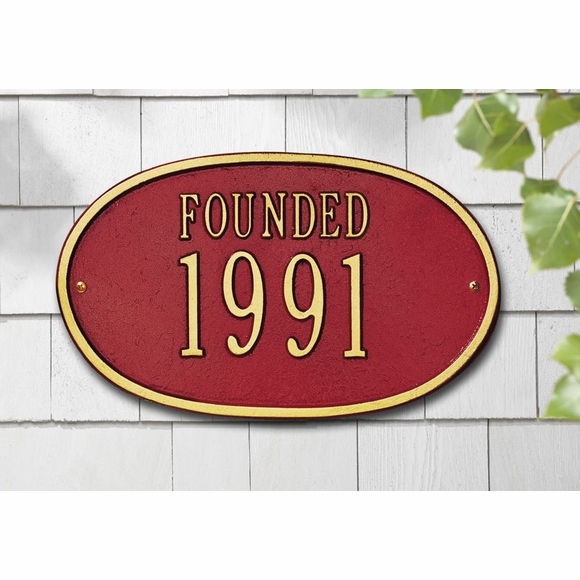 12.5" x 7.5" oval historic plaque shows the founding year of a home, building, business, park, or any other institution. Wall mount. Holds four 3" numbers under the word FOUNDED. Colors(from left to right in small images): AB antique brass; AC antique copper; BG black with gold characters; BS black with silver characters; BW black with white characters; GG green with gold characters; OB oil rubbed bronze; OG bronze with gold characters; PS pewter with silver characters; RG red with gold characters; and WG white with gold characters. You can also purchase this historic marker with the word BUILT, CIRCA, or ESTABLISHED (see Related Products).